And you thought the first Saturday in May was solely about Kentucky Derby betting. Think again as there’s plenty of tradition that adds to the atmosphere of the whole event. We all know about the importance of the hat tradition at the Kentucky Derby. There are also the roses, the singing of “My Old Kentucky Home” and a few other traditions worth mentioning, but one that many people may not know about as it isn’t highly publicized is the mint julep. This is considered the official drink of the Kentucky Derby and has a rich history and it certainly has evolved over the years. While the origins of the mint julep are a little sketchy at best, there is no denying its place in the history of the Kentucky Derby and in the southern United States as a whole. This is an enduring tradition that is going to go on along with the hats, the Kentucky Derby odds, the garland of roses and everything else that goes into “The Most Exciting Two Minutes in Sports”. There are all kinds of theories as to where the mint julep came from but it seems like the most prevalent theory is that it came out of the southern United States sometime in the late 1700’s – possibly around 1770 or so. In West Virginia at the Old White (which is now known as the Greenbrier, the site of a PGA Tour event and Ryder Cups in the past), the mint julep gained fame as their drink in the early 1800s. However, some believe that the drink came from the Arabic part of the world even further back than the 1700’s, consisting of rose petals and water before mint came into play. The mint seems like it would be quite an improvement over rose petals. Some people even say it started in Louisiana, Virginia, South Carolina, and a number of other states from the southern part of the country that you can think of, so take any history you get about the mint julep with a grain of salt (or sugar). But it has really been adopted by Kentucky and that is the place where it is going to be connected to for the most part. 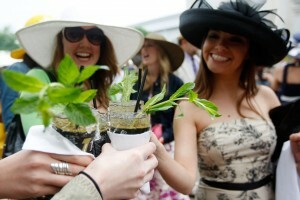 It was made the official drink of the Kentucky Derby in 1938 and there are estimates that over 120,000 mint juleps are sold during Kentucky Derby weekend, which also includes the Kentucky Oaks. That’s the Derby for the fillies even though fillies are also allowed in the Derby should they be deserving of a spot. Besides the rose petal fiasco, juleps consisted of whiskey or brandy when it was first made. However, after the Civil War, bourbon was used because quite frankly, it was cheaper and there wasn’t a lot of money to go around. Water and sugar was added to cut through the alcohol and make it a little sweeter. That helps make the drink far more palatable, especially for those who aren’t into the harsh tastes of strong alcohol. There are some places in the United States that will substitute gin for bourbon when making their juleps but for the most part, bourbon is the alcohol of choice. Anyone betting on Kentucky Derby, or for those who have visited Churchill Downs, know that bourbon is definitely the first choice. It seems as though the smart thing to do when making a mint julep on your own is to make the mint syrup first. It is quite simple to make this as all you have to do is crush some mint leaves in the bottom of a cup until it forms a nice paste. Then you only need a couple tablespoons of the syrup to make one serving of a mint julep. Don’t overdo it or else you might need an immediate trip to the dentist. Start off by making the mint syrup. Take your cup and fill it about halfway with the crushed ice, then put the syrup in, followed by the bourbon and the water. Then you stir the concoction until your cup has a frost on it. Add the mint sprig at the end as a garnish. At the Kentucky Derby, mint juleps used to be served in a silver cup, which added to the frosted look that patrons were used to. Now, they are served in highball glasses or sometimes, a Collins glass. You may even find them to be served in pewter cups, which also helps with the frosting. Churchill Downs has been giving their patrons souvenir glasses since 1939 to give them something to remember. Now that you know the recipe, you can make it at home while you bet on Kentucky Derby lines. Then you move into the extra premium mint juleps that are custom made and these are for those who can afford to spend a solid thousand dollars on a drink. Obviously, that’s the crowd that sits in Millionaire’s Row and bets big amounts on the Kentucky Derby contenders. This practice began in 2006 and the ingredients are a little different than what you would probably find in the drinks served to the regular folks. These are served to patrons in a gold cup (made by jeweler Tiffany’s, no less) with a silver straw, with Woodford Reserve as the specific bourbon to be used. There is mint that comes straight from Ireland, crushed ice flown in from the Bavarian Alps and even the sugar is special, imported all the way from Australia. Does anyone really know the difference between regular and Australian sugar? Plunk down $1,000 and you can find out. However, this is all for a good cause as the proceeds from the extra premium mint juleps go to charity, usually named after retired thoroughbreds that made their name at the Kentucky Derby. So at least it is being put to use.